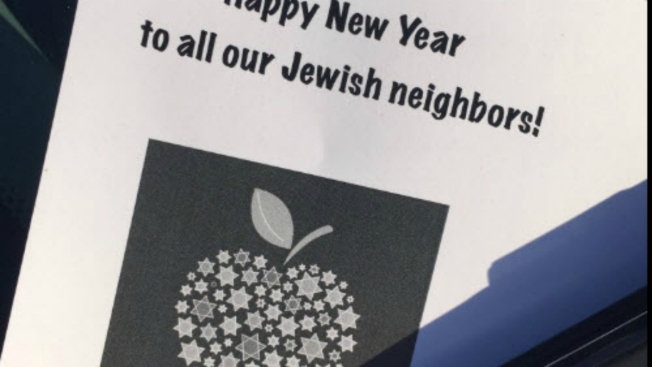 After several Jewish residents of Lafayette were rattled when a man in a Santa hat was seen placing rambling, anti-Semitic fliers on their cars last week, some mystery leafletter tried to change the tone of hate — to one of cheer. On Friday, two days before the Jewish New Year, called Rosh Hashana, someone placed black-and-white pieces of paper that read "Happy New Year to all our Jewish neighbors! along with a photo of an apple, a symbol of the holiday." The message, sprinkled with Jewish stars and the greetings in transliterated Hebrew, was the antidote to what had transpired in the BART parking lot earlier in the week. Several riders had found their car windshields decorated with anti-Semitic fliers, that called Jews "baby killers" and "serpents." At first, BART officials as well as the American Civil Liberties Union said they couldn't remove the fliers because they didn't specifically target anyone for violence, and were therefore protected under Free Speech. However, on Wednesday, one Jewish BART rider said a man in a Santa hat was leaving the unwanted pieces of paper, and threatened to harm him when he asked him to stop. BART police recommended the Contra Costa County District Attorney charge the man with disturbing the peace, but the DA on Thursday ultimately decided not to take the case any farther. The victim told investigators that he didn't fear the man in the Santa hat would follow him home and carry through with his threat. Some who found the new year's greetings fliers on their cars were pleased. Rosh Hashana ends on Tuesday at sundown.